Told you more southern food was coming your way. Well, technically this is Jamaican food done southern style, but still. I am pretty much hooked on this whole southern thing. I seem to go through these phases, and currently southern comfort/ light and fresh summertime food is it. I am obviously very much enjoying this phase. Not sure how southern comfort + light and fresh summer food go together, but I feel like it’s a good balance of buttah and fruit. So this chicken is actually my first experience with making real deal fried chicken. I know it isn’t really classic fried chicken, but I seem to have a hard time sticking to “classic”. BUT, it is all kinds of fun and awesome. Typically, I am not crazy about anything fried, thus my reasoning for not having ventured into the fried chicken zone. But lately I have been going through an “oh man, that would be so much better fried” stage, and I must say, I’m definitely having fun with it. Also, the pickled pineapple slaw? Like 3x YES. Please excuse my obsessive use of pineapple and fruit in the coming weeks. 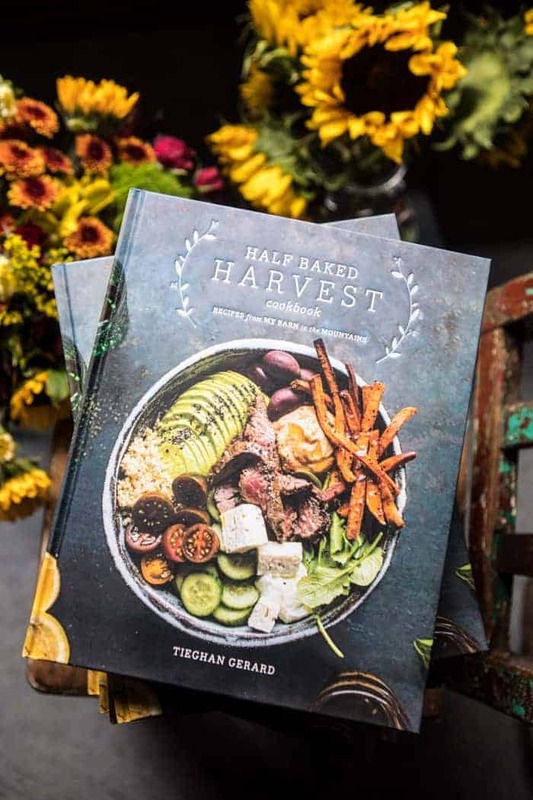 With all this daydreaming of summer, heavy on the fruit recipes have been brewing in my head…which to me is a big TWO thumbs UP. 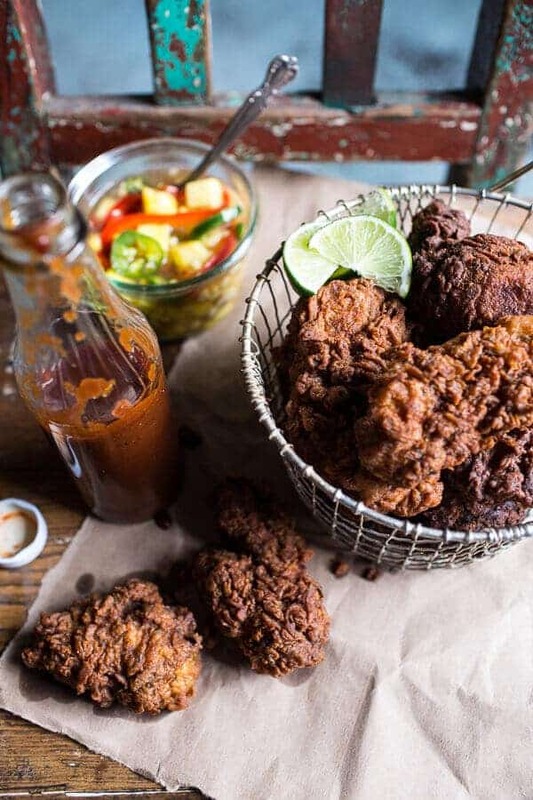 Ok, back to the point of this post, this almond buttermilk Jamaican fried chicken. I really do adore this chicken. I must say, I had a bit of a hard time eating any of the dark meat pieces and mostly stuck with the white tenders. I think there may have been some brainwashing that took place in my youth because I know I should be all about the dark meat, but in my house it was strictly white tenders. I need to snap out of it! Regardless, it’s the flavors, the sauce and the slaw that really set this recipe apart. Go for whatever type of chicken you prefer. Everything starts with an almond buttermilk brine. I know that may sound a little funky, but sometimes, all I have on hand is almond milk, and even though the grocery store is not a far drive, the thought of running to the store just for buttermilk is pretty much dreadful. SO I wondered what would happen if I made an almond milk style buttermilk. I knew it had been done before so I really was excited to give it a try. You just need almond milk and apple cider vinegar. It’s as simple as that, AND I pretty much always have both of those ingredients on hand. Nice! For this recipe, I used Almond Breeze Almondmilk Coconutmilk Blend (it’s honestly my favorite!) and I think the hint of coconut goes incredibly awesome with the Jamaican flavors. With that said, I also think the plain almond milk would work equally well, just make sure it is unsweetened, as you really do not want any sweetness. Ok so now I have to tell you about the spices and BBQ sauce I made. Oh my gosh. SO GOOD. 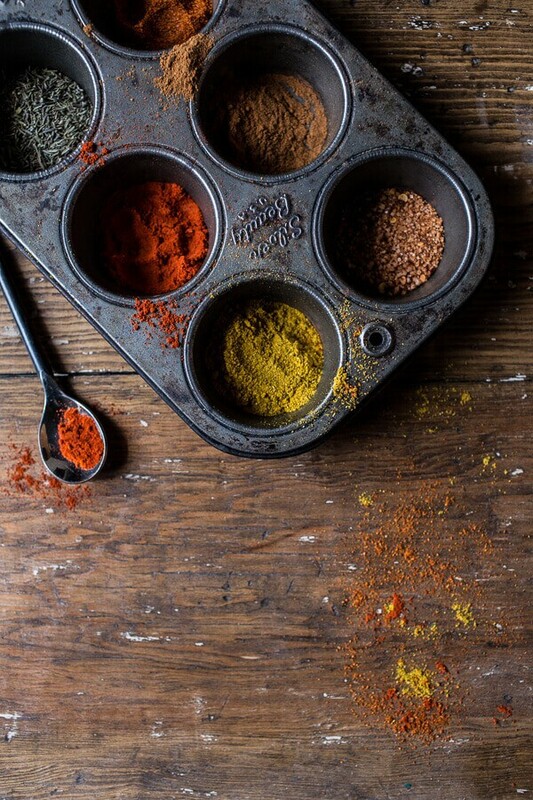 The spice mixture gets added to the almond milk mixture and then also used to spice up a quick homemade BBQ sauce that you honestly cannot skip. 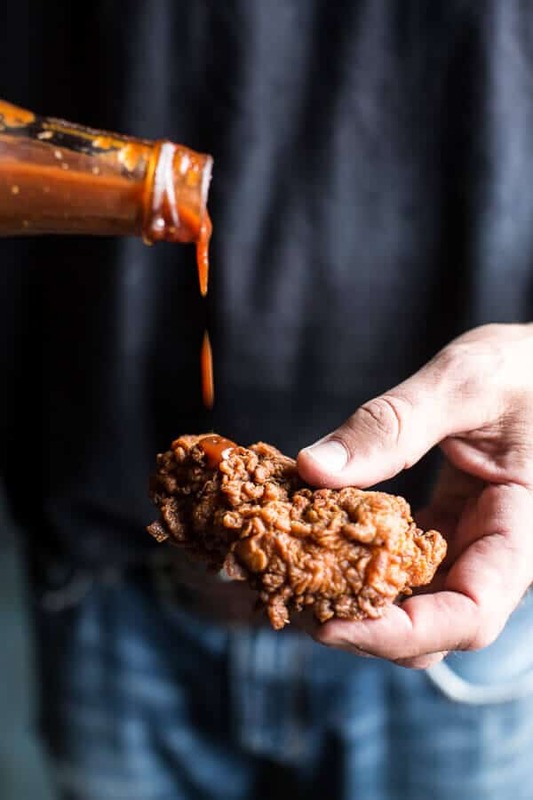 I know hot sauce is more typical with fried chicken, BUT this BBQ sauce is everything, tangy, slightly sweet and all kinds of spiciness. Seriously, guys the sauce is what’s up. The other thing you have to make is the slaw. I mean, I know I am a bit pineapple crazed right now, but this slaw brings some balance to the fried chicken supplying it with some much needed healthier elements. I know, balance again, but hey, I think I’m gettin kind of good at it…right? So this chicken is actually my first experience with making real deal fried chicken. I know it isn't really classic fried chicken, but I seem to have a hard time sticking to "classic". BUT, it is all kinds of fun and awesome. To make the spice mix, in a small bowl combine the garlic powder, onion powder, dried thyme, paprika, cayenne pepper (I used 2 teaspoons), all-spice, brown sugar, cinnamon, salt and pepper. 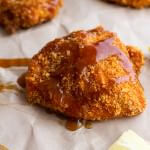 To make the BBQ sauce, in another small bowl, combine the ketchup, orange juice, soy sauce, molasses and 1 - 1 1/2 teaspoons of the spice mix (start with 1 teaspoon, taste and add more if needed). Cover the BBQ sauce and store in the fridge until serving or up to 1 week. In a large bowl, add the Almond Breeze and 2 teaspoons apple cider vinegar. Whisk in about 2 tablespoons of the spice mix. Add the chicken and make sure it is submerged in the almond milk. 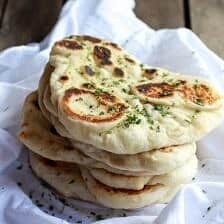 Place in the fridge for 1 hour or overnight. Heat the canola oil to 350 degrees F. in a deep heavy bottomed pot. Do not fill the pot more than 1/2 full with oil. 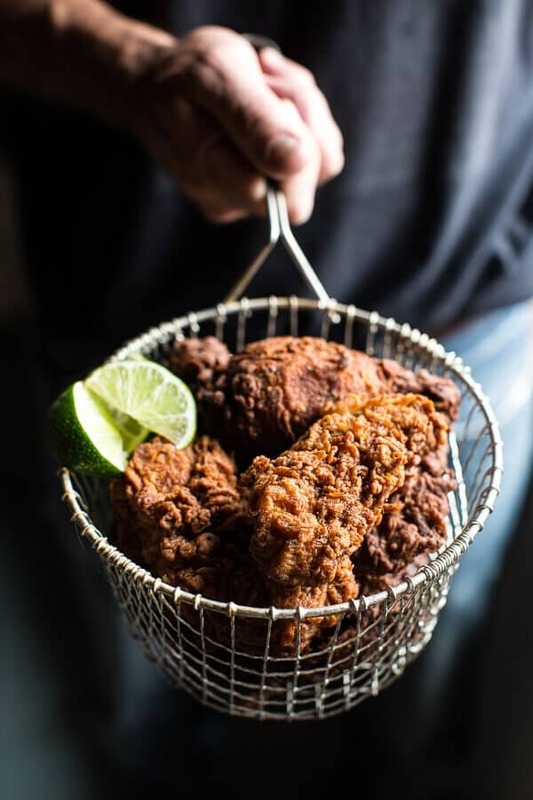 When ready to fry, add the flour to a shallow bowl and dip each piece of chicken through the flour. If desired you can then dip the chicken back in the buttermilk mixture and then back through the flour for a double coating. Once the oil is hot, fry the chicken in batches until brown and crisp. Dark meat takes longer then white meat. 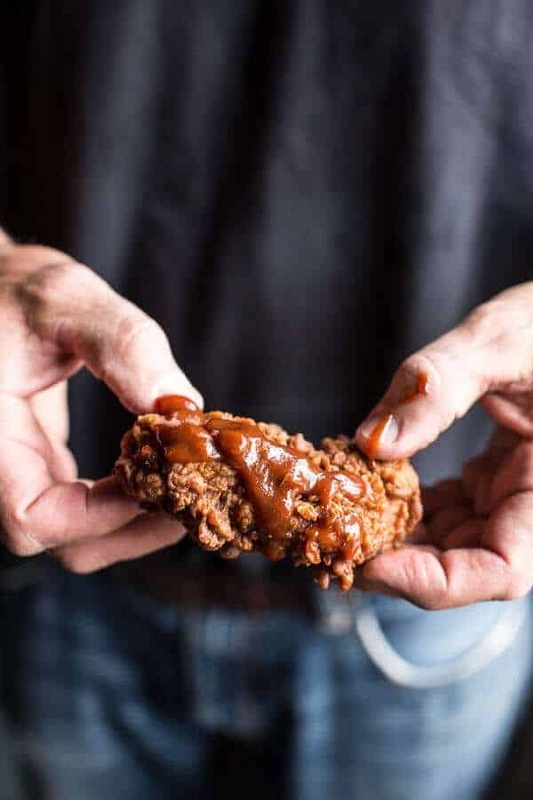 It should take dark meat about 13 to 14 minutes, white meat around 8 to 10 minutes, but this will all depend on the size of you chicken pieces. Serve the chicken with the BBQ sauce for dipping and the pickled pineapple slaw (below). 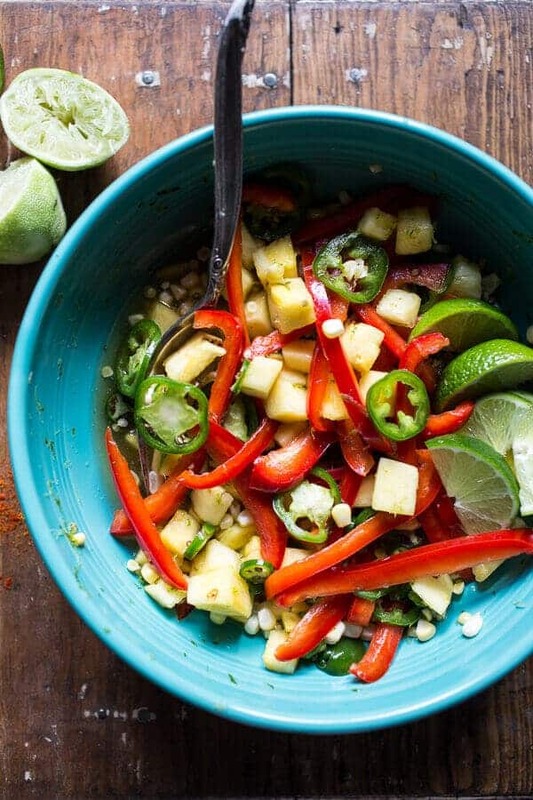 In a bowl, combine the pineapple, corn kernels, bell pepper, jalapeno pepper (seed if desired) and the zest of 1 lime. In a small sauce pan, combine the apple cider vinegar, salt and sugar (or honey). Bring the mix to a boil, stirring often to help the sugar dissolve. Remove from the heat and add the lime zest. Pour the mix over the pineapple medley and allow to cool completely. 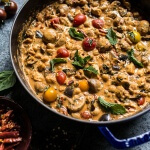 Serve along side the chicken or store in the fridge for up to 1 week. 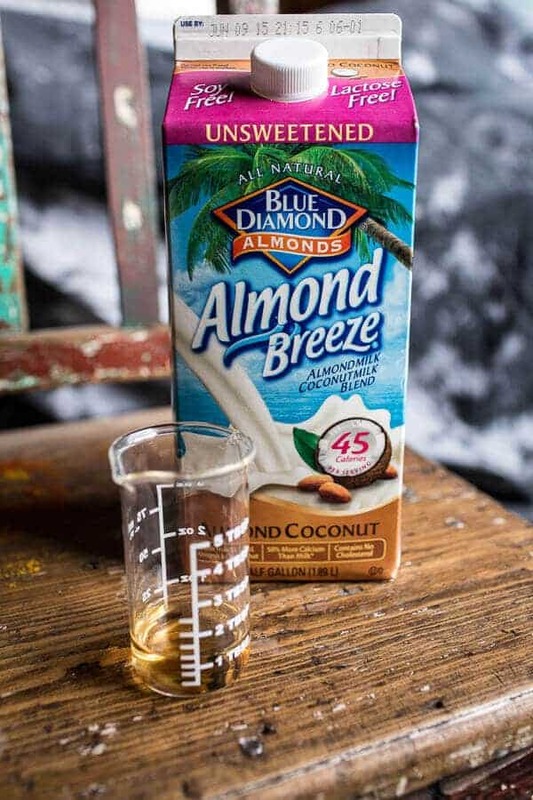 *[Almond Breeze Almondmilk Original Unsweetened | https://www.almondbreeze.com/?navid=329&pid=508] or [Almond Breeze Almondmilk Hint of Honey Vanilla | https://www.almondbreeze.com/?navid=592&pid=593] will also work. Minus the slaw, cause you know, he doesn’t do fruity. LAME. 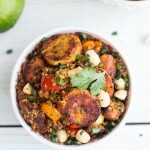 Jamaican Jerk Chicken, Fried Plantain and Coconut Fried Quinoa with Macadamia Nuts. Loving the southern / fruity combo- it seems like the perfect way to balance things out (: Also- who would have ever thought to use coconut almond milk in fried chicken?? 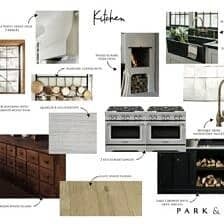 I’m amazed at the way your brain comes up with recipes. I love how you made buttermilk out of almond milk so cool. This chicken looks insanely good….love the slaw. 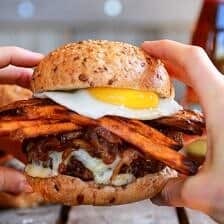 Mmmmm, this looks soo good! I love fried chicken, but I find it a pain to make. But this looks so tasty I may have to give it another go! Great looking slaw too. I don’t eat dark meat either. I only buy chicken tenders or breast. Just something about that dark meat. Yuck!! OK the fried chicken is not on the doctors list but I am making the slaw. 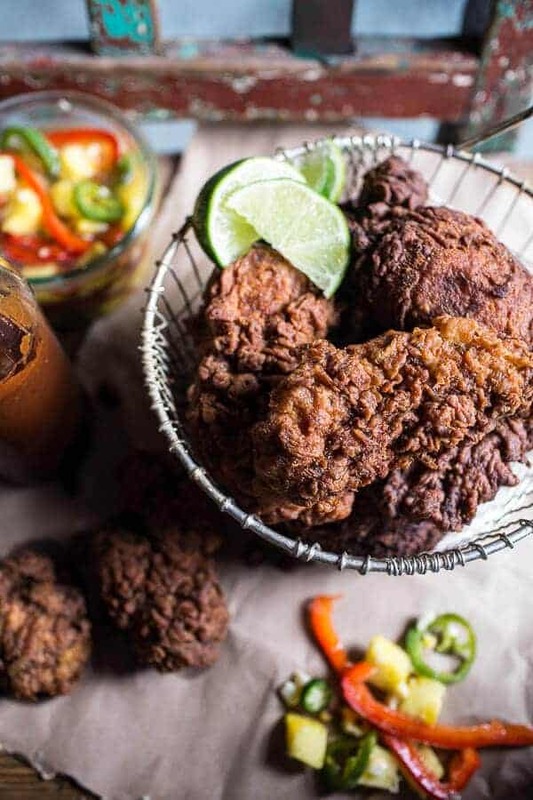 This is definitely fried chicken summer BBQ approved! And the rum-pickled pineapple slaw! What the?? Sounds sooo good!! Fried chicken sounds amaaaaazing!! So good for the soul! I had fried chicken last night……, and I still want this chicken! Looks fantastic, but chicken tenders, really!? The pineapple slaw recipe lists fresh corn. Does this mean it’s not previously cooked? I’ve never had raw corn before, does it soften a little with the vinegar, lime juice and rum mixture? It just looks amazing! Yes, raw corn and yes, it does soften a little. Please feel free to use grilled or boil corn if you prefer though. Hope you enjoy the recipe! That colorful slaw is so pretty, I would absolutely inhale it! Perfect side to that killer fried chicken! Forgive me for possibly raining on your parade, but what exactly about this dish is Jamaican? I’m Jamaican and I find quite often that people draw inspiration from our culture,which is great,but also some people use the name to draw appeal to their products when their products really have no bearing or foundation in Jamaican culture. 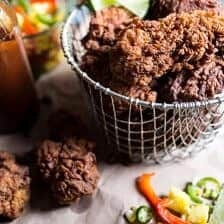 I’ve read and re-read the recipe, hoping that I’m being harsh but I haven’t found anything that would allow you to call it Jamaican fried chicken. I’m a little offended,which I doubt was your intention. I am sorry to have offended, that was not my intention. Honestly, I feel that the seasonings are Jamaican inspired from all the info I have read and experienced. I am sorry if you feel differently. To be honest, I generally really love your website. This was just a small concern of mine because I’ve seen it happen on many blogs. No hard feelings! I totally get it and thank you so much for the kind words!! I will try and research a little more before claiming a recipe is a certain ethnicity. Really am sorry if this is not Jamaican enough for some!! The Soy Sauce, Orange Juice, Cinnamon, Coconut Milk and the ALLSPICE scream JAMAICAN. Pimento/Allspice is native to Jamaica, and a few other places around the Caribbean. Sub in molasses for the brown sugar, and gyal could make a nice Jerk Chicken if she took it to the grill instead of the fryer. Gahhhh these look so awesome! 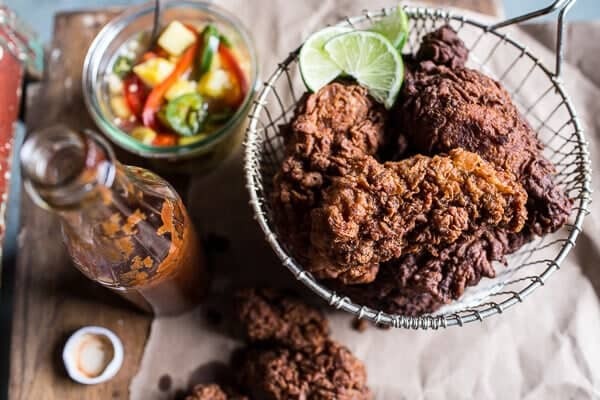 This fried chicken looks amazing. One question before I try it…. 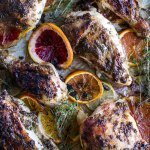 What is the sauce that is poured over the chicken? That is the BBQ sauce in the recipe. It is listed in the directions. Let me know if you have any other questions. Happy New Year! 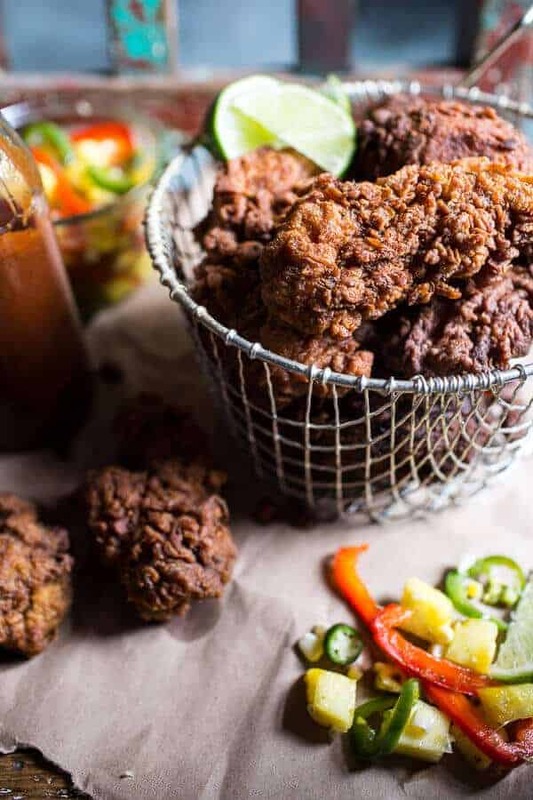 The “Jamaican” fried chicken is most definitely NOT NOT NOT Jamaican in any way, shape, or form! Pineapple slaw… not Jamaican either! I’m Jamaican so I know. STOP appropriating someone else’s culture by using a name and a place and a culture that you know nothing about. Jalapenos are NOT a Jamaican ingredient. There’s not even habanero pepper in it. Have you ever even been to Jamaica? Hello! 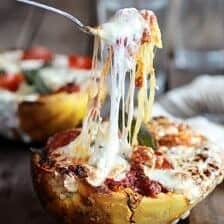 I just want to say that I love all of you recipes! 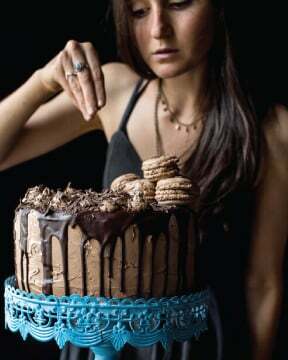 I want to try making this one but I don’t have any self rising flour in the house right now. I have white and whole wheat flour. Would either of those be an acceptable substitute?